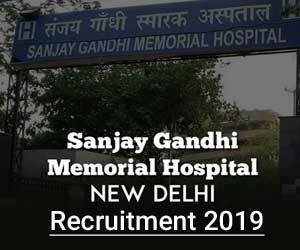 New Delhi: The Sanjay Gandhi Memorial Hospital (SGMH) Mangolpuri has released a notification for 72 vacancies for the post of Junior Residents on Regular Basis. The selection will be done through Walk-in-Interview. Post are reserved as per reservation rosters. In case of non-availability of suitable candidates of reserve category, reserve category seat(s) will be filled by candidates of Unreserved Category on Adhoc basis. Out of total posts, 4% posts are reserved for Person with Disabilities as per rules. MBBS degree from a recognized University and should be registered with Delhi MedicalCouncil (DMC)or applied for registration in DMCon or before last date of submission of forms. Must not have completed one-year Junior Residency in any recognized institution/hospital including regular & Adhoc basis. Not more than 30 years for General category candidates and Relaxable as per applicable norms for reserved categories on the date of interview.OBC candidates are required to submit their updated caste certificate issued by the Govt. of NCT of Delhi on prescribed formaton or before the date of the interview. As per 7th CPC Pay Matrix level- 10(Pay Rs. 56100/- plus allowance) as admissible under the rules. NOTE:-1. Competent Authority reserves the right to any amendment, cancellation and changes of the advertisement. 2. Bring duly filled application form with photograph & checklist (Formats enclosed. Internship:- Candidates must have completed compulsory rotatory internship on or after 05.02.2017. Tenure: The maximum tenure of Junior Residents (MBBS) is for a period of one year only including any service rendered as Junior Resident earlier on Adhoc/Regular basis in any recognized institution. The appointment will be initially for 89 days that can be extended further up to a maximum period of 01 years subject to satisfactory performance, work and conduct report from concerned HOD and written request from the doctor concerned. i. Upper age limit for eligibility for JR will be 40 years. ii. In case of non-availability of fresh candidates, the candidates who have already completed 01-year Residency as JR. Resident may also appear in the interview. iii. Separate merit lists for fresh candidates and for other (i.e. those who have already completed 01 year Junior Residency would be prepared. iv. Firstly, the list containing the names of fresh candidates would be exhausted for appointment and the second list would be used only after that. v. Post Graduate doctors who are interested to serve as Junior Residents will be allowed to join as Jr. Residents. vi. All appointments for Resident-ship from second list will be for one year only. It would not be renewable after one year. Students registered in other state medical council are eligible or not??? ?